WAUKESHA, Wis., Oct. 29, 2018 (GLOBE NEWSWIRE) -- Telkonet, Inc. (OTCQB: TKOI), creator of the EcoSmart platform of intelligent automation solutions is proud to announce the launch of its' next generation thermostat, the EcoTouch Flex WiFi. The EcoTouch Flex WiFi features the ability to provide elegant individualized WiFi thermostats for markets beyond hospitality. Positioning Telkonet to further expand into the residential market, the EcoTouch Flex WiFI allows residents to control and automate their thermostats with the Symphony Sonata mobile app giving residents control over their systems at home and away. 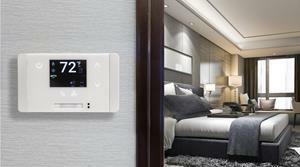 The next generation thermostat, the EcoTouch Flex WiFi. The EcoTouch Flex WiFi features the ability to provide elegant individualized WiFi thermostats for markets beyond hospitality. Currently being deployed for a large commercial customer in Hawaii, the EcoTouch Flex WiFi features all of the industry-leading features of the EcoTouch+, with its sleek modern glass design and built-in occupancy and humidity sensors. But the EcoTouch Flex WiFi has been "set free," no longer relying on additional hardware. Instead, it uses existing WiFi infrastructure directly, providing a single-device energy management system for residents. "The first market that we're targeting is managed housing and apartment buildings," said Telkonet CTO Jeff Sobieski. "With a high-end individualized WiFi thermostat consumer experience, we're looking forward to expanding into higher-end residential buildings and helping mechanical contractors supply intelligent energy management systems to these customers. We feel the EcoTouch Flex WiFi is a great candidate for small retail spaces, with its quick and easy setup and mobile management." As with all Telkonet thermostats, the EcoTouch Flex WiFi is universally compatible across a wide array of HVAC systems. It features an easy-to-use onscreen maintenance interface and provides an innovative use of proximity sensors to dim the display when not in use, increasing guest comfort and extending battery life. The EcoTouch Flex WiFi also offers the same energy-savings benefits as all other EcoSmart thermostats, including an end to false occupancy readings: it will not switch to an "unoccupied" mode when an occupant is sleeping; nor will it remain in an "occupied" mode when a room is vacant. Like all of Telkonet's smart thermostats, its integrated technology evolves as needs change, making the EcoTouch Flex WiFi a truly flexible HVAC system controller.